Children are born engineers. Everything they see, they want to change. They want to remake their world. They want to move dirt and pile sand. They want to build damns and make lakes. They want to launch ships of sticks. They want to stack blocks and cans and boxes. The want to build towers and bridges. They want to control the universe. They want to make something of themselves. I am interested in how K–12 educators plan to implement the engineering component of the Science-Technology-Engineering-Mathematics (STEM) effort. The same tradition in public education that supports the teaching of mathematics and science at the K–12 levels does not exist for the teaching of engineering at those levels. Much of the STEM curriculum I've looked at focuses on design. But, as I heard one engineering professor state, "Not all design is engineering and not all engineering is design." There are electrical, aeronautical, marine, chemical, civil, and software engineers. But from that short list the branch that I would choose to start to build a curriculum around is civil engineering. That is the type of engineering that kids do without formal, adult instruction or supervision. 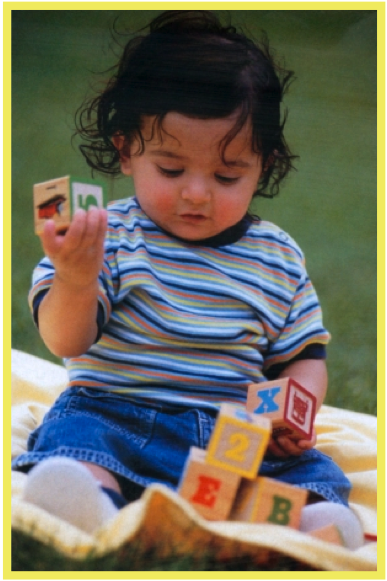 Kids design and build structures in their world of play. If kids are 'born' engineers as Dr. Petroski believes then kids are born civil engineers. The task then becomes one of identifying what civil engineers know and do and then translating their knowledge and skill into age appropriate, activity based curriculum. As I researched what civil engineers know and do, I learned that there are five basic construction forces and six basic structural members. Many of these are conceptually appropriate at the K-8 level and all are appropriate at the 9-12 level. 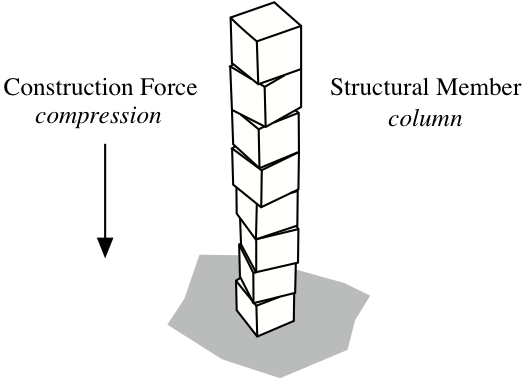 For example, to the civil engineer, a stack of blocks is a structural member called a column. The dominant force acting inside the column is compression, one of the five construction forces. A stable tower will not collapse from internal forces (the weight the blocks) but it is susceptible to external forces—another youngster can come along and knock down the tower (see video at end of post). is distributed over the area of the bottom face. Science defines pressure as force per unit area. 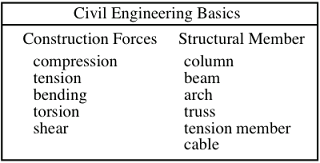 This is expressed in the following formula. If a block is stacked on top of the first block, then the pressure on the bottom face (red) of the bottom block doubles. And so on through as many blocks as there are in the stack. 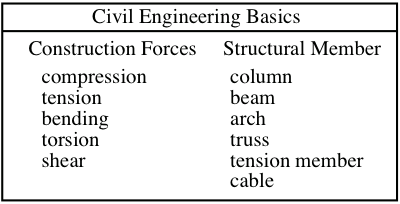 This is a linear relationship. Note that the pressure on the bottom face of any block equals its weight and the weight of the blocks stacked above it. This weight presses down on every block in the stack except the top block. Hence the term compression. The civil engineer calls this pressure stress. 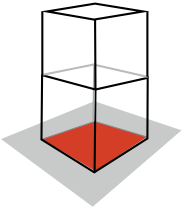 The force acting on the bottom face of the bottom cube of the tower is equal to the weight of all of the cubes in the stack. That, of course, equals the weight of the number of cubes in the stack. The greatest internal stress (pressure) acts on the material near the bottom of the bottom block. The material that the block is made of has to be able to withstand this stress. And the foundation (ground) the column is standing on also has to withstand the total stress of the column. Hence the need to build on a firm foundation. Not all forces acting on the column are internal forces. Wind, earthquake, and collision can exert external forces on the column. Next to the pleasure of building a tall column of blocks is the pleasure many feel in knocking it over. In the following video, a horizontal force is applied a column of cylindrical blocks. A friend captured the collapse of the column, in slow motion, on his iPhone. Slowing down the collapse reveals that several interesting events happen in the short time it takes for the column to collapse. Can you spot them?